Climate experts say that global warming is melting sea ice faster than expected, which is why the poles currently have the most sea ice ever measured for the date. “There is a good chance that there will be more sea ice on Earth on January 1, than ever measured before on that date.” Steven Goddard @ ‘Real’ Real Science. And how many millions of taxpayer dollars did it take for you to produce that very accurate model? I’m going to go out on a limb here and say none. The data collection was probably quite costly, but analyzing it takes less than 5 minutes. If you’re competent, and honest (not in the pay of evil forces). Just goes to show even a small furry creature like yourself (inside joke folks, see the image at top of page) can do much good. Well that explains everything. You think that all the data collection is free. Probably alp believed ObamBam when he said you could keep you doctor, keep you insurance plan and he quit smoking. I have to say, I am impressed by the scientifically informed responses here. However, NO ONE has mentioned that the sun is coming into it’s 11-year solar MAXIMUM and it just so happens to be the WEAKEST maximum following an incredibly weak 11 year low activity level. All to say that if you watch the sun’s activity, and it has been extremely weak for 12 years now, the earth will be COLDER… The Earth has been cooling since 2004, and is now getting colder! Took a PhD to figure that out.. Even the Russians are predicting 20-30 years of colder weather… WATCH THE SUN! The root problem is sixty-eight years of purposeful deception about the Sun. The consequences will be fatal for society if government policies continue to be based on lies, . . . Revealed by three figures 1-3 of precise experimental data that consensus scientists ignore. Index to New Notch-Delay Solar Climate Model by Dr. Evans, Jo Nova’s Husband. Steve Goddard focuses on the shenanigans at NOAA. That’s your problem Steve you only spent 5 minutes. Years of analyse will reveal there was only a small amount around one boat on the shore of Antarctica that Captain Hazelwood was piloting. Warming, What warming? Te prediction is 65 kyr of COLD! 2. Hides other data (Xenon isotope data from the Galileo Mission to Jupiter). We have clear and unequivocal evidence of that. Do you need more evidence they don’t know what they’re talking about? Their logic is completely distorted. It has to be to try and justify the reality of the situation. There is a great deal of humor in the climate predictions of those on the government payroll, but the possible consequences of government deceit is deadly serious. Most of it is in the Southern hemisphere just after the summer solstice so albedo will have a profound effect. Perhaps we are at a Tipping Point ® . Or “could be”, depending on how the solar cycles progress. Hmm, that’s strange. I’ve been searching for Northwest Passage rowing expeditions that are planned for 2014, and I haven’t found any yet. I wonder why. Hmmmmm, let’s see. The risk of making yourself into global fools, relentlessly mocked for blind faith belief in global warming dogma, inability to understand numerical concepts like bigger and smaller, more and less. You have to be a really major Greenie Kool Aide chugger to want to play row boater at the North Pole. All the fools got eaten by Poley Bears during the last few seasons. That is why the Poley Bear population is so healthy. It’s really quite simple— Trenberth’s missing heat has gone into the deep oceans and forced all of the cold water to the surface, whereby it freezes more easily when mixed with the excess CO2 particles being forced into it. All of the models (114% of them, actually) predicted exactly that. But why would the warm water sink? Honest question, I’m just curious. Not a climate expert so I wouldn’t know. Ever heard of the thermohaline circulation? Chris Turney and his Guardian journalist pals would probably show up for SF/GB wild card game in Bermuda shorts and flip-flops such is their devotion to AGW. As the ‘CO2 is evil’ grant trough is still full of tax-payer’s misappropriated funds, they will still feed well from it. Until western nation stop the madness and vote for sense it will continue. Yeah, yeah, sure it looks like maybe global sea ice is going up — but that graph is cherry picked! See, just drop off 2002, 2007 and 2013 which are CLEARLY outliers and then you will see a clear downward trend! Any bets on whether some CAGW cultist tries that argument? Actually, I would bet not. Using that argument would presuppose the existence of a warmist who actually pays attention to the data. Ain’t gona happen… If they paid attention to the data they would be sceptics. Hopefully this will put the nails in the man-caused global warming coffin, but if it does not, here is some help:CO2 is a “trace gas” in air, insignificant by definition. It absorbs 1/7th as much IR, heat energy, from sunlight as water vapor which has 188 times as many molecules capturing 1200 times as much heat making 99.9% of all “global warming.” CO2 does only 0.1% of it. For this we should destroy our economy? Brilliant. The warmer periphery is freezing and gaining ice, while the much colder interior is melting. You deserve a Nobel Prize. Your theory for explaining the antarctic sea ice, I say theory as you seem well beyond the hypothesis stage, is that out in the middle of the Southern Ocean around Antarctica where the sea ice forms with an average temperature around minus 10 to 20 degrees, the global cooling of the earth dropped the temperature down a degree or two and that accounts for the additional sea ice. If science could always be so intuitive. I prefer to consider the hypotheses offered by Guy Williams of the University of Tasmania. I was wondering when someone was going to drag out the ol’ dead nag of “Antarctic albedo isn’t as important as Arctic!” canard. BC, I took a look at suyts. Several things jumped out. The importance of the Arctic sea ice is for it to exist during the summer when the most sunlight is present and the albedo is most important. The Antarctic sea does not exist during the summer, only in the winter when very little sunlight hits to be albedoed. Suyts also did not seem to understand the importance of albedo. Open water is much darker than ice and snow, and dark anything absorbs heat. matataya, you are completely ignorant of the most basic facts on this subject. You don’t even understand that there is as much sunlight in the spring as in the summer! You are just wrong that there is no Antarctic sea ice in the summer. It is summer there now and there is plenty of sea ice. That’s what those ships got trapped in. The sun is at its highest now in the southern hemisphere and there is an unusual amount of Antarctic sea ice reflecting that sunlight back to space. Even at the end of the SH summer, the sea ice never completely disappears, and in recent years there has been more at the end of the summer. Look at some graphs of Antarctic sea ice extent. There is no “flat-bottom” to the graph during summer. Furthermore, the Antarctic sea ice has a far greater albedo effect than the Arctic sea ice. At its maximum extent it reaches to about 60 degrees latitude at the time of the vernal equinox, where as the Arctic sea ice only reaches to about 75 degrees latitude. It is the spring ice that has the greatest albedo effect, and because the sun is a lot higher in the sky at 60 degrees than at 75 degrees, changes at the boundary have a far greater effect around the Antarctic. Fundamentally, you have everything backwards. Where do you see anything that says that Antarctic sea ice doesn’t exist in the summer? The Warmistas who were just rescued from their little propaganda stunt might have a few things to say about there not being any sea ice there. Also, if you would look through all of suyts’ posts, you’ll see the very prescient explanation as to why Antarctica’s land ice is so much more of albedo-inducing machine than any amount of Arctic sea ice— There’s much more of it and it’s at a much lower latitude (at all times of the year), thus reflecting much more light back out into space. PS: I’m glad that someone from the other side can come here and have a civil discussion, instead of just coming in and flaming away. Kudos! Overall Antarctica is losing land ice only through tortured statistical analysis -=- not in the real world. Those who want to claim ice loss have sophisticated computer models on their side, but their disconnect from reality continues to erode their credibility for those who wnat to think and understand instead of wanting to be fed propaganda. Reality: Objects that were on the ice surface 15 years agao are now buried — and there is other evidence increasing ice. Antarctica is much better “laboratory” for the CO2 question than the Arctic. CO2 is a recognized as a well-mixed gas, so its increase in Antartica is noted; however, Antartica is isolated from many other phenomenon that hit the Arctic. The northern ice cap is subject to the effects of air pollution, carbon deposits, ocean currents, PDO, AMO and (more) human visits & effects. (Also, the Arctic Ocean has more variance in underwater volcanoes which a few scientists think are significant — but most believe are these eruptions are insignificant.) Therefore, if CO2 is the driving force, we are more likely to see it in Antartica than in the Artic. Your CO2 hypothesis doesn’t jive with the fact that Antarctica starts out 50 degrees colder than the Arctic. That buried object you speak of may have been buried in the interior of East Antarctica which is gaining land ice, but overall, Antarctica has been losing land ice at an accelerating rate. The Arctic and Antarctica have completely different climate systems and can’t be compared side by side. … being melted from below by geothermal heat, researchers at the Institute for Geophysics at The University of Texas at Austin (UTIG) report in the current edition of the Proceedings of the National Academy of Sciences. They found these sources are distributed over a wider area and are much hotter than previously assumed. The geothermal heat contributed significantly to melting of the underside of the glacier, and it might be a key factor in allowing the ice sheet to slide, affecting the ice sheet’s stability…. In the first ever-survey of its kind, a chain of massive volcanoes that rise up to 1.86 miles were discovered lurking beneath Antarctic waters near the South Sandwich Islands in the remote Atlantic Ocean… The expedition’s shipboard sonar scans reveal twelve new undersea volcanoes, some rising nearly two miles from the seafloor. Several of them have clearly been active in recent times…..
A paper published a year ago finds Antarctica has been gaining surface ice and snow accumulation over the past 150+ years, finding acceleration in some areas. “…a clear increase in accumulation of more than 10% has occurred in high Surface Mass Balance coastal regions and over the highest part of the East Antarctic ice divide since the 1960s….” The entire Antarctic continent has been gaining surface ice mass over the past 150 years and Antarctic surface ice mass is presently growing by 2100 gigatons per year. …Our SMB reconstructions indicate that the SMB changes over most of Antarctica are statistically negligible and that the current SMB is not exceptionally high compared to the last 800 yr. High-accumulation periods have occurred in the past, specifically during the 1370s and 1610s. However, a clear increase in accumulation of more than 10% has occurred in high SMB coastal regions and over the highest part of the East Antarctic ice divide since the 1960s. To explain the differences in behaviour between the coastal/ice divide sites and the rest of Antarctica, we suggest that a higher frequency of blocking anticyclones increases the precipitation at coastal sites, leading to the advection of moist air in the highest areas, whereas blowing snow and/or erosion have significant negative impacts on the SMB at windy sites. Eight hundred years of stacked records of the SMB mimic the total solar irradiance during the 13th and 18th centuries. The link between those two variables is probably indirect and linked to a teleconnection in atmospheric circulation that forces complex feedback between the tropical Pacific and Antarctica via the generation and propagation of a large-scale atmospheric wave train. Another paper says the same the Antarctic ice sheet is growing in mass. During 2003 to 2008, the mass gain of the Antarctic ice sheet from snow accumulation exceeded the mass loss from ice discharge by 49 Gt/yr (2.5% of input), as derived from ICESat laser measurements of elevation change. The net gain (86 Gt/yr) over the West Antarctic (WA) and East Antarctic ice sheets (WA and EA) is essentially unchanged from revised results for 1992 to 2001 from ERS radar altimetry. Imbalances in individual drainage systems (DS) are large (-68% to +103% of input), as are temporal changes (-39% to +44%). The recent 90 Gt/yr loss from three DS (Pine Island, Thwaites-Smith, and Marie-Bryd Coast) of WA exceeds the earlier 61 Gt/yr loss, consistent with reports of accelerating ice flow and dynamic thinning. Similarly, the recent 24 Gt/yr loss from three DS in the Antarctic Peninsula (AP) is consistent with glacier accelerations following breakup of the Larsen B and other ice shelves. In contrast, net increases in the five other DS of WA and AP and three of the 16 DS in East Antarctica (EA) exceed the increased losses…. Not only is the amount of sea ice increasing each year, but an underwater robot now shows the ice is also much thicker than was previously thought, a new study reports. The discovery adds to the ongoing mystery of Antarctica’s expanding sea ice. According to climate models, the region’s sea ice should be shrinking each year because of global warming. Instead, satellite observations show the ice is expanding, and the continent’s sea ice has set new records for the past three winters…. The findings were published today (Nov. 24, 2014) in the journal Nature Geoscience. What does the expanding ice mean? …In the new study, the researchers found evidence that Earth’s polar ice sheets began growing between 3.1 million and 2.7 million years ago. However, this time frame means that the glacier growth preceded the growth of major glaciers across North America — the earliest compelling evidence suggests Northern glaciers began growing about 2.7 million years ago. The researchers suggested that the growth of the Antarctic ice sheet altered ocean currents worldwide. More Antarctic sea ice would have meant there was less warm, salty water from the North Atlantic that rose upwards and mixed withthe surface waters surrounding Antarctica. Instead, this conveyer belt of heat would have redirected into the deep waters of the Pacific Ocean, and these changes in heat flow might have been substantial enough to initiate glacier formation in the Northern Hemisphere…. Drake Passage is the waterway between South America and the Antiarctic. If the sea ice continues to grow at the same rate it has for the last few years Drake Passage will be come ice clogged. ABSTRACT: The effect of Drake Passage on the Earth’s climate is examined using an idealised coupled model. It is found that the opening of Drake Passage cools the high latitudes of the southern hemisphere by about 3°C and warms the high latitudes of the northern hemisphere by nearly the same amount. This study also attempts to determine whether the width and depth of the Drake Passage channel is likely to be an important factor in the thermal response. A deeper channel is shown to produce more southern cooling but the magnitude of the effect is not large. Channel geometry is relatively unimportant in the model because of a haline response that develops when the channel is first opened up….. I wonder what are you guys going to do when the AMO flips cold again and Arctic Ice grows back above normal. I’m looking forward to seeing the knots you will tie yourself up into explaining how growing Arctic ice is caused by warming, and how fast you will trumpet Antarctic sea ice declines (from record highs). Try to do that all in one breath for a challenge. Now imagine how funny will be if, for whatever reason, the “see-saw” effect lingers a little and we have the continuation of the present recovery of the Arctic ice *plus* the repeated records of the Antarctic ice for a few years more. They’re already so “confused” to explain what happened in 2013 (sending failed “expeditions” and “rowers” to Antarctic and Arctic to prove their models, because the data refuses to collaborate… ) that I believe (or I hope) at some point they will simply give up with the absurdities and try at last to make sense of the facts. Is there a limit for non sense, when absudity tends to infinite? Warming southern ocean? Uh, no. Albedo? I’m sure everyone on board the HMS Inconvenient Truth will be glad to hear that there was no sea ice during the summer solstice this year. A lot of bunker fuel could have been saved had you spoken up just a little sooner. Matayaya, did you just say Antarctic sea ice is absent in summer? You might check up the latest research from Prof Turney of UNSW. He found so much ice he didn’t know what to do with it all. We are approaching the peak of summer right now in the SH. The sun is 7 percent stronger due to the fact that the earth is closer to the sun now. The SH sea ice is far closer to the equator then the NH sea ice. So what are you trying to say about the albedo? The RSS data show a slight atmospheric cooling over the past twenty years. The SST had also slightly cooled over that time. Studies of land ice conflict, and any reasonable error bars make them statistically meaningless. So what have you got left Please show me your study documenting an increase in outflowing air mass from the SH polar interior over the past twenty or so years. David, Antarctic sea ice peaks in September and reaches its minimum in February. The sea ice edge will soon be back to its’ historical starting point near the shore soon just as the sun angle starts to get high. There will be negligible sea ice then to provide significant albedo. Whereas, the Arctic Ocean historically has had a very significant amount of sea ice during the summer to provide significant albedo. The sun is now high in the SH. Dec 21st is the longest day of the year down yonder. The ice is retreating, but that is because it is much closer to the equator then the NH sea ice, and being pounded by a TSI that is 7 percent stronger. There are stil The NH albedo is weighed against a much higher water refraction angle, a weaker TSI. Do the math. It does not support your paradigm. You stated, “The Antarctic sea does not exist during the summer.” It is just past the longest day of the year, (maximum albedo) and there are millions of sqK. An ice breaker is stuck in your non existence ice. David, my point is that the 1 percent more Antarctic sea ice informs neither one way or the other. The Antarctic is the least understood system on Earth. No point in arguing on that just yet. Call it natural if you like. The significant loss of summer sea ice in the Arctic is far more significant, understood and worthy of arguing about if you so choose. Mata…. thanks for dropping by. Weird that I would be reading this as you were perusing my humble blog, but, you found the wrong post regarding your point about the importance of NH vs SH, you see, the start point for the ice in the SH never gets much south of 70 deg lat, whereas in the NH the ice doesn’t get much south of 70deg lat. You can go here for a graphical representation with polar maps. suys, interesting point you are making though the Antarctic sea ice extent you showed was only 3 weeks after the maximum extent. If we are talking about sun angle and amount of albedo, I would argue not much albedo could be expected from that sea ice. Sort of like being able to directly look at the sun with no harm in the late afternoon. It is summer time when the sun angle is higher when albedo becomes important, re the importance of the summer sea ice of the Arctic Ocean. If you really want to talk about albedo, you should maybe pay more attention to winter northern hemisphere snowcover, which since the PDO cooled in the late 2000s has been on the increase, thus higher albedo as a result. http://climate.rutgers.edu/snowcover/table_area.php?ui_set=1&ui_sort=1 In the end, snowcover nor sea ice, although each having their effects on climate are most analogous to atmospheric teleconnections like the PNA, EPO, AO, NAO, TNH, etc. They really aren’t drivers of the climate, they are merely indicators of larger scale forces like THC, cosmic rays, solar cycles, AMO/PDO etc. If you understood the importance of these large-scale drivers you wouldn’t be very surprised at all to see how quickly arctic sea ice responded this year to a record decline in the THC in the spring of 2013 which also helped lead to the downfall of the 2013 hurricane season via feedbacks in enhancing the subtropical Azores-Bermuda gyre & +NAO phase both of which remove heat out of the deep tropical Atlantic & broaden the local Hadley Cell limiting focused convergence in the tropics. You could also add that the lack of el nino for 4 years has had a substantial effect on Atlantic hurricane ACE as we’ve seen many times in the past when global & Atlantic ACE tends to crash towards the end of & just following deep multi-yr la ninas. What about cloud cover do you see the total cloudiness increasing during the next (possibly 8 years or so) of the rest of the present solar cycle. Do you see this as a possible factor influentiating the trend to La Ninas? Of course, I also understand that the solar cycles, specifically the peaks & minimums in activity help modulate flips in the QBO from its east-westerly phase, thus we conclude that at least from an indirect standpoint that the solar cycles by influencing QBO which shows strong relation to the PDO, is indeed influencing what happens over the Pacific. It helped a lot Eric, thanks. I have not even a fraction of the understanding of the whole system that you have, but I could also note the important correlation between the AMO and PDO, for example, when the PDO warmed from 2012 to 2013, simultaneously with the decrease of the AMO from the spike in 2012. The occurrence of repeated La Ninas in connection with the flips of the AMO to negative phase and the frequency of El Ninos never having a period of less than 4 years between successive episodes are also important points in your comment. The correlation of the PDO with ENSO seems clear, but I believe there is a new factor that could be forcing colder waters into the equatorial Pacific, which is the increasing anomaly of the Antarctic ice extent. I believe I have been observing negative anomalies being pushed toward lower latitudes since the end of 2011. In fact, this “forcing” seems strong enough that it could have been an important factor in the reversal of the El Nino trend at the end of 2012. The polar regions show strong sensibility to solar forcing and if solar radiations were a bit stronger we’d probably not have the extraordinary recovery of the Arctic ice in 2013 and the repeated records of the Antarctic ice. With our present level of radiations the cooling seems to be starting at the poles and then propagates to lower latitudes. which I think is much simpler and more reliable than NASA’s “salad”. We just went past the winter solstice, and yes the SH ice is down to 6.5 million km2, but, that surrounds the Antarctic, which is 14 million km2. The Arctic ice never gets to 20 million km2. So, yes, the NH can have significant amounts of ice which never see daylight in the winter. But, that’s an impossibility in the south. suyts, another point here is what is new to the climate system. Maybe that additional winter sea ice in the Southern Ocean will help with the albedo, but what is really different is the reduced summer ice in the Arctic. It is all about energy balance. What is different than before that affects energy balance to the climate system. Do you have actual data for this statement or is it just your belief? The data I have is showing something very different. Again that’s what you want to believe, it’s different from the data I have. You’re not analysing correctly the trend of the sea ice and, consequently, concluding wrongly about polar temperatures. You also have to consider that the Arctic is completely surrounded by landmass vs the antarctic that is completely surrounded by ocean, & that the ocean has 1100x the heat capacity of the atmosphere. Also knowing that after the Antarctic millions of years ago split away from the Australian continent it has since been surrounded by the Antarctic Circumpolar Current that makes this area comparatively less susceptible, although still slightly vulnerable to “outside” influences on sea ice. Thus, given this information it is plausible to conclude that the relatively minor increases in Antarctic sea ice observed over the course of the satellite era are indeed as significant if not much more so than what’s occurring in the arctic. Forget Global Warming. I have been keeping track of the daylight hours for several months now and it appears the days are getting shorter and shorter. I predict that within 24 months, the entire Earth will be in total darkness, all life will perish. Woe are we!! Can someone explain the contents of the file timeseries.global.anom.1979-2008 for me please? It seems very odd that a figure as precise as 17.0578232 (see last line) should occur 35 times over the years. Doh! Please continue to ignore the above question. It’s probably an aspect of the model used to find the average, for example the numbers “17.1322975”, “19.7558384”, etc. are also repeated many times, indicating some type of periodicity. I don’t have the details though. Thank you for the explanation of the columns in the table. I was just about to ask Tony. The head line says December 31st, Global Sea Ice Area Was Largest Ever Recorded. How is that possible if Antarctic sea ice maximum is in September and the minimum is coming up next month? “most sea ice measured for the date.” – but you jest, of course. And It’s gonna be very close to the highest minimum sea ice extent on record in Antarctica. Temperatures are very cold down there despite 24 hr sunshine. Let’s clear things up a bit. Climate experts are saying that global warming is melting ARCTIC sea ice, yet you appear to be providing data for the ANTARCTIC not the global data. The global data would be around 35.2 kilometers squared. Therefore, you are either intentionally misleading your readers or you don’t understand what you are talking about. If you want to see the data analyzed by folks that know what they are doing, and know how to properly label a figure. Check out the original source: http://arctic.atmos.uiuc.edu/cryosphere/ You will noticed that the Northern Hemisphere sea-ice anomaly for “the date” is well below the 1979-2008 mean. That should read 35.2 million kilometers squared, lest some get confused. Sorry Steven, jumped the gun you are right this is global data. Feel free to delete my comments. Experts don’t know what they are talking about. All you have to do is stick your head outside once a day to see how warm/cold it is. If its hot today, then we classify that as extreme global warming. If it is cold outside, we classify that as the result of extreme global warming. This isn’t rocket science you know. Great analysis. You’ve certainly blown the doors off the global; conspiracy with this one. But I’ve tried to duplicate it using the data you cite and can’t. How exactly are you processing the time series in the file you link to to get the figure you show? It almost appears as if you’ve made a mistake since there isn’t an obvious method to get the final year so high. Any standard averaging method I’ve used (splines, running means, digital low-pass filtering) shows the peak for the end of 2013 is still significantly lower than the peaks in the 80’s and 90’s. In fact, it appears that the max in 2013 is even below the average for the 80’s and 90’s. Earth warms and cools in cycles, cycles inside of cycles, inside of cycles inside of 10,000 cycles. 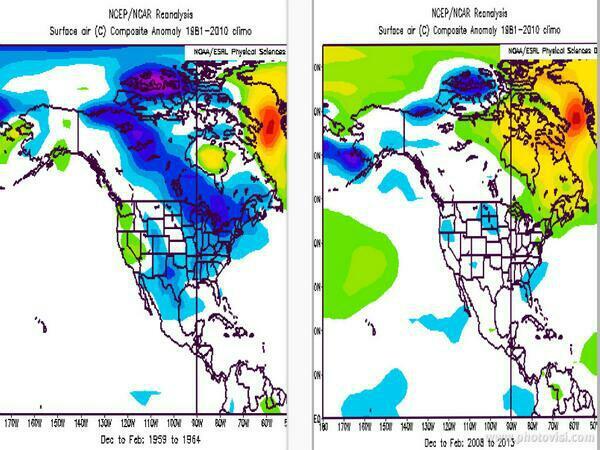 little cooling cycle 1945-1977 brought ice age scare of the 1970’s. Little warming cycle 1978-1997 brought global warming scare along with liberal “let no crisis go to waste” manipulation of us. 1998-2030 cooling cycle brings the “global warming cause global cooling” scare to keep the crisis going. Pretty stupid claim about Dec 31st, since most of December is higher in quite a few years. But, very ironic that global sea ice anomaly started it’s plunge, within days of Dec 31st. now down nearly 2 million square kilometers. What’s odd is that every sum of the 365 values from 1979 to 1980 (incremented one day each) yields the SAME value! Then in 1981, (summing 1980 to 1981), the numbers change as expected. Starting 1982 it does it again, the SAME number for all 365 results and on top of that… the SAME number as that for 1979-1980. That repeats for another 2 years then the values change for a year then back to the SAME number for another 3 years. That four year pattern repeats all the way to 2014 with 2014 being one with that SAME value again. Is it something I did wrong or did I find an Easter Egg from someone playing games at uiuc? I do believe the referenced data file is indeed the digital version of the graphic. Though it does take some time to figure out! If by “third column” you actually mean the last column (the third column after the date), that column is the average ice-area for that day of the year; that is, the sum of all the ice-area figures for that day of the year divided by the number of years covered. I believe the four-year pattern you are talking about is marked by the recurrence of leap year every four years. See Michael D. Smith’s explanation of the columns, above, January 4, 2014 at 3:10 am.